utilize a Monoammonium Phosphate dry chemical. It chemically insulates Class A fires by melting and clinging to the heated surface, smothers and breaks the chain reaction on Class B fires and is a non-conductor of electricity. Units are available in a range of sizes from 2 1/2 to 20lbs. capacity. Superior quality - manufactured to exacting standards under ISO-9002, tested to ANSI/ UL standards. Coast Guard approved when used with bracket listed on extinguisher. Rugged construction - easy and less costly to maintain and service. Bar coded labels for documenting extinguisher locations, inspections, maintenance and recharging. 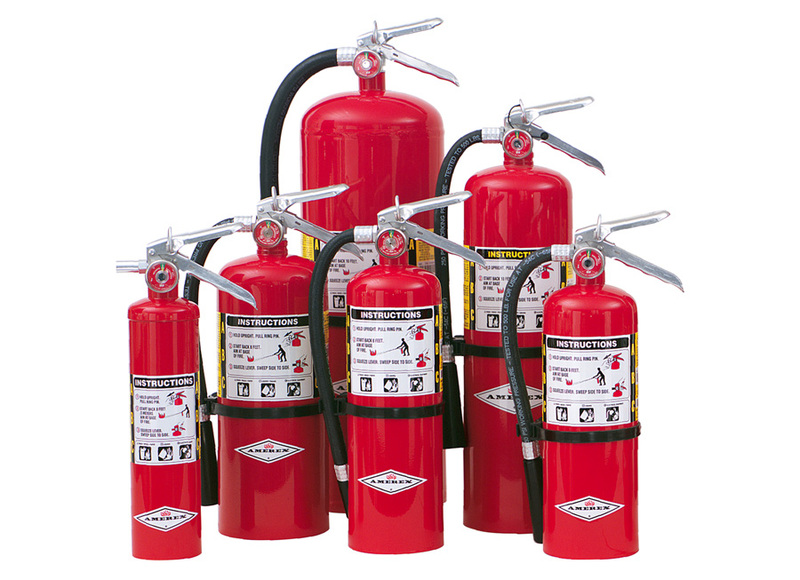 Class K "Kitchen Use" Wet Chemical Extinguishers contain a special potassium acetate based, low PH agent developed for use with pre-engineered restaurant kitchen systems included in the NFPA 10 1998 edition. The recent trend to more efficient cooking appliances and use of unsaturated cooking oils dictates the use of a hand portable fire extinguisher with greater fire fighting capacity and cooling effect to combat these very hot and difficult fires. Unit comes complete with charge. Attractive and durable - easy to use extension wand for greater safety. Large, easy to read operating instructions. Factory tested and developed on commercial deep fat fryers using the same fire tests as UL 300 Pre-engineered Restaurant systems. Application wand keeps operator at safe distance from the fire. Low PH Wet Chemical agent discharges as a fine mist helping to cool the appliance and preventing reflash. UL class C rating assures safety when used around electrical appliances. Fine spray mist prevents splashing of grease. Extinguishing agent can be applied to the fire surface exclusively - no dry chemical "fall out" to clean up. Excellent for use on all cooking appliances including solid fuel charbroilers. 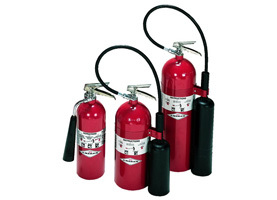 Carbon Dioxide (CO2) Portable Fire Extinguishers are effective for Class B flammable liquid fires, is electrically non-conductive, and is a clean, non-contaminating odorless gas, safe for use on clothing, equipment, valuable documents and food. Units are available in a range of sizes from 5 to 20lbs. capacity. 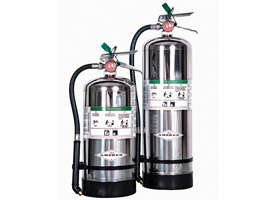 Rust free aluminum cylinders - up to 30% lighter than steel for use in corrosive environments. Low magnetic brass valve/aluminum cylinder meets many hospital medical equipment requirements. P (804) 530-3062 | © Fire Defense Services, Inc.